Villas at Tangalooma have the best Tangalooma beach house accommodation available on Queensland´s glorious Moreton Island. Tangalooma is home to some of Australia´s best beaches and has been a favourite holiday spot for many couples and families for many years. So if you are looking for a great family holiday or just a relaxing getaway then why not book yourself into one of our Moreton Island Villas, where you will be surrounded by beauty and entertainment. Numerous holiday activities are available in Tangalooma, such as archery, surfing, sand tobogganing, environmental walks, 4WD tours, swimming, and much more. Take advantage of the fact that one of our Tangaloom island villas are right in the middle of all these activities. 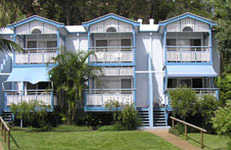 Tangalooma Resort on Moreton Island is a popular tourist destination. Tangalooma is the best place for a secluded holiday, so book right now your Tangalooma holiday today and get the perfect beach house for your dream getaway. Check our booking availability now to see if you are able to book your next holiday in one of our beachfront villas.